Whether you’re up for a coastal trail or a hike in the hills, a bunch of new innovations pack even more benefits into this great British pioneer. We’ve upgraded the lightweight comfort with a streamlined, one-piece construction in soft but strong leather that resists water, laughs off abrasions and helps prevent blisters. Meanwhile, incorporated GORE-TEX® technology keeps water out while letting sweat escape, so your feet will never get clammy. Effectively absorbing shocks and jolts, anti-clogging soles shed sticky mud, while memory-foam heel and toe features cushion you from impacts and give you the snuggest of fits. 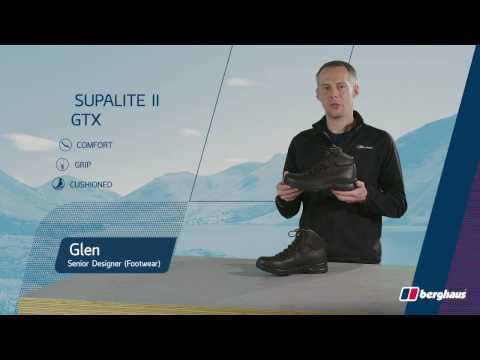 LIGHT AND COMFORTABLE The lightweight Supalite II GTX won't slow you down, with no compromise to performance, durability or comfort. ALL-DAY COMFORT Streamlined, one-piece leather construction with GORE-TEX® performance technology and memory foam details bring you more comfort than ever. STEADY TREAD Our latest lightweight leader now comes with an outsole developed by the world’s leading outdoor rubber sole manufacturer VIBRAM® to soak up shocks and shrug off mud.